Oleksandr Yaroshchuk is a prize-winning Ukrainian journalist. Currently, he works for factchecking organization StopFake where he refutes disinformation and fakes on the Internet. He contributes to national online outlets and writes about energy, agriculture, and social affairs. Oleksandr has his own blogs in national media, where he shares his opinions about Ukraine’s current and future. He is also an analyst at the Energy Industry Research Center, an organization which promotes energy reforms in Ukraine. 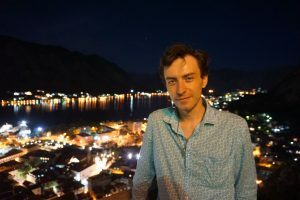 Oleksandr has a Master degree in journalism and now he is also a PhD Candidate in journalism at the National University of Kyiv-Mohyla Academy. His dissertation is on the limitations and constraints of investigative journalism in Ukraine and other post-Soviet states. In 2018, he was recognized as one of the most promising young journalist of Ukraine. At the moment, he is developing two journalism projects on science and education which he wants eventually to become cross-border. Oleksandr believes that this workshop will help him in developing his current and future projects.